ANAHEIM, CA--(Marketwired - Dec 10, 2013) - Casita at Colony Park marks high on a homebuyer's wish list for its combination of innovative, functional floorplans and exceptional lifestyle offered within the community and in the NEW Anaheim. That lifestyle just got even better, with the recent opening of The Cabana at Colony Park. Specifically for the use of Colony Park residents and their guests, this new recreational facility is yet another great way to enjoy the community, with comfortable seating areas for lounging, a saltwater pool, barbecues and outdoor entertainment spaces that are ideal for socializing with friends or making new ones. Private resort-style amenities at Colony Park offer unique spots for relaxation, recreation, and revelry. The Cabana is just one of three exclusive recreation centers offering a host of amenities for the whole family. Compass Park features a saltwater pool, covered outdoor pavilion with barbecues, and a green park. The Pool House offers indoor-outdoor entertainment areas, a saltwater pool, spa, outdoor fire pits, a bar, barbecues, and a lounge for parties. The Pool House also has a community manager who plans a variety of events throughout the year. Soon, these facilities will be joined by Colony Bark, a community dog park for Colony Park's four-legged furry friends. "The Cabana brings even more value to a community that is brimming with the type of resort-style amenities today's buyers are looking for. Our homeowners love being able to host gatherings or hang out and meet neighbors in Colony Park," said Rocky Tracy, Vice President of Sales for Brookfield Residential. "They also love to walk around the NEW Anaheim and enjoy the variety of restaurants, bars and shopping. Living in Colony Park truly is one of the most surprising and satisfying new-home opportunities in Southern California. Interested homebuyers who have not yet discovered all that Casita can bring to their life are encouraged to visit soon or log onto www.BrookfieldSoCal.com for immediate details." One of the final neighborhoods selling at Colony Park, Casita offers prices from the low $500,000s plus low HOA dues and eco-smart features that reduce utility bills by 25%-40% compared to neighboring cities. Innovative detached and paired home designs showcase 3 to 4 bedrooms, 2.5 baths, 2-car garages and private outdoor spaces in approximately 1,384 to 1,931 square feet. For the ultimate urban new-home environment, it doesn't get any better than Casita at Colony Park. From modern home designs and resort recreation to the unmatched opportunities for dining, socializing, playing, and living it up in the NEW Anaheim, Casita has it all. No longer will you have to live in your car, scurrying from place to place in traffic after work and on weekends. When you live at Casita in Colony Park, coffee at Center Street Promenade or breakfast at Gypsy Den is just a stroll away. Post-work yoga at The Yoga Mat and dinner at Umami Burger at the Anaheim Packing District -- it's all in a day's play at Casita. The Anaheim Packing District, just a short stroll from Casita, is a unique gathering place for food, drinks and music that includes: the Packard Showroom, where Anaheim Brewery and Umami Burger are now open; Farmers Park, an outdoor marketplace that hosts an array of community activities; and the future Packing House, a culinary center that brings together artisan food producers and purveyors in a public market type setting. For more information, visit www.Anaheimpackingdistrict.com. The Historic Colony District is an incredible activity zone unto itself, with numerous cafes, art and entertainment options. In the center is "Colony Park," the location of Anaheim's newest Art in Public Places and home to multiple children's play areas. This revitalized area of Anaheim includes a new thriving art community that encompasses the Packing District, the Muzeo Museum, and Center Street Promenade. With three major freeways within easy reach of the community, Colony Park is also convenient to all of Orange County as well as Los Angeles, San Diego and Inland Empire work centers. Brookfield Residential Properties (BRP) is a leading North American land developer and home builder, with operations in eleven major markets, committed to creating the best places to call home. BRP benefits from strong geographic diversification with operations in Austin, Calgary, Edmonton, Denver, Phoenix, Los Angeles, Sacramento, San Diego, San Francisco, Toronto and Washington, D.C. Brookfield Residential Properties is listed on the NYSE and TSX under the symbol BRP. For more information, visit BrookfieldRP.com. 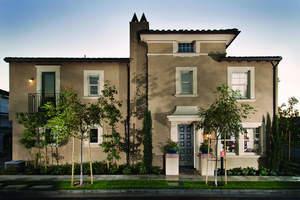 Casita at Colony Park offers detached homes and traditional townhomes surrounded by private resort-inspired amenities.